Toenail fungus is an infection of the toenail and the nail bed. 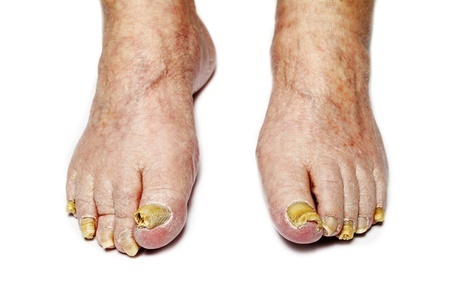 The proper name of this infection is onychomycosis. It causes a number of problems in the nail, which are evident when simply looking at the toenail. Treatment is often difficult because it infects both underneath as well as inside of the toenail. Generally, toenail fungus can come from a damp, public environment–anywhere the general population has been without shoes. This can include a locker room, a hotel bathroom or even a public pool. Risk tends to vary by age, but also those who perspire a lot tend to contract this fungus easily, as well as those who live in more humid climates. Due to it’s humid and warm climate, toenail fungus is very common among residents of the Houston area. Today, nearly 10% of all Americans suffer from toenail fungus infections. Toenail fungus is most commonly caused by a dermatophyte that has reached the underside of the nail plate or into the nail bed. Due to it’s location on the underside of the nail plate, this infection is very hard to treat. Topical creams are generally not very effective, as they simply cannot reach the infection through the nail. Alternatively, patients can be prescribed oral medication for treatment, but these medications have a number of side effects that may lead to health risks. Patients who take these oral medications may be required to have liver enzyme testing. The oral medications are often not very effective in many patients. Often due to ineffective treatment, many people who suffer from toenail fungus may treat it for years, sometimes at great expense, while never getting any better. While the outward signs of toenail fungus are darkened, yellow, cloudy, brittle, and thick toenails, many times the confidence of those who suffer is also affected. Those who suffer from toenail fungus often will never want to wear sandals, never get pedicures, and never feel confident barefoot. They often avoid situations where they should be barefoot, such as going to the beach or the pool. In a warm climate like Houston, closed toed shoes can actually cause excessive foot perspiration which simply perpetuates a fungal infection. Hiding toes in sweaty shoes only makes the infection worse. The best way to kill the toenail fungus, and break the cycle, is to seek out the only treatment that has been shown to penetrate through the nail into the nail bed.